Doctors, healthcare providers, and organizations tend to use abbreviations and we want you to know what they mean. Also, we have included brief descriptions of some of the blood tests, diagnostic tests, and other myositis-related conditions. ALDOLASE: Aldolase is a protein (called an enzyme) that helps break down certain sugars to produce energy. Aldolase levels can be used to diagnose or monitor muscle or liver damage, and elevated Aldolase levels can indicate damage to the liver or muscles. ALT: The Alanine Aminotransferase test measures the amount of this enzyme in the blood. ALT is found mainly in the liver, but also in smaller amounts in the kidneys, heart, muscles, and pancreas. ALT was formerly called serum glutamic pyruvic transaminase (SGPT). ANA: An ANA test detects antinuclear antibodies (ANA) in your blood. Your immune system normally makes antibodies to help you fight infection. In most cases, a positive ANA test indicates that your immune system has launched a misdirected attack on your own tissue — in other words, an autoimmune reaction. AST: An aspartate aminotransferase test measures the amount of this enzyme in the blood. AST is normally found in red blood cells, liver, heart, muscle tissue, pancreas, and kidneys. 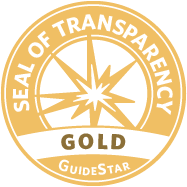 AST formerly was called serum glutamic oxaloacetic transaminase (SGOT). CBC: Complete Blood Count test is used to evaluate your basic blood profile and test things like white and red blood cell count, hemoglobin, and platelets and is used to screen for a wide variety of possible conditions such as anemia, infection, and inflammation. CK/CPK: Creatine Phosphokinase (CPK) is also referred to as CK (Creatine Kinase), is an enzyme found mainly in the heart, brain, and skeletal muscles. This blood test is commonly ordered when someone is suffering from muscle weakness. 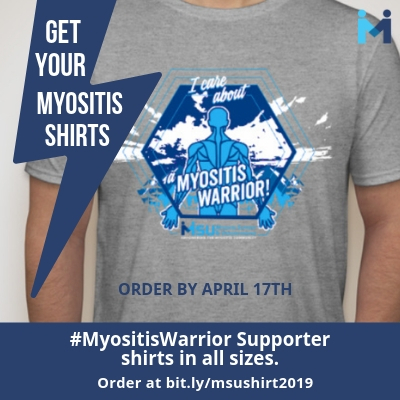 When muscle is damaged, CPK leaks into the bloodstream and a high level usually means there has been injury or stress to muscle tissue which are indicators for polymyositis, dermatomyositis, other myopathies, and muscular dystrophies. 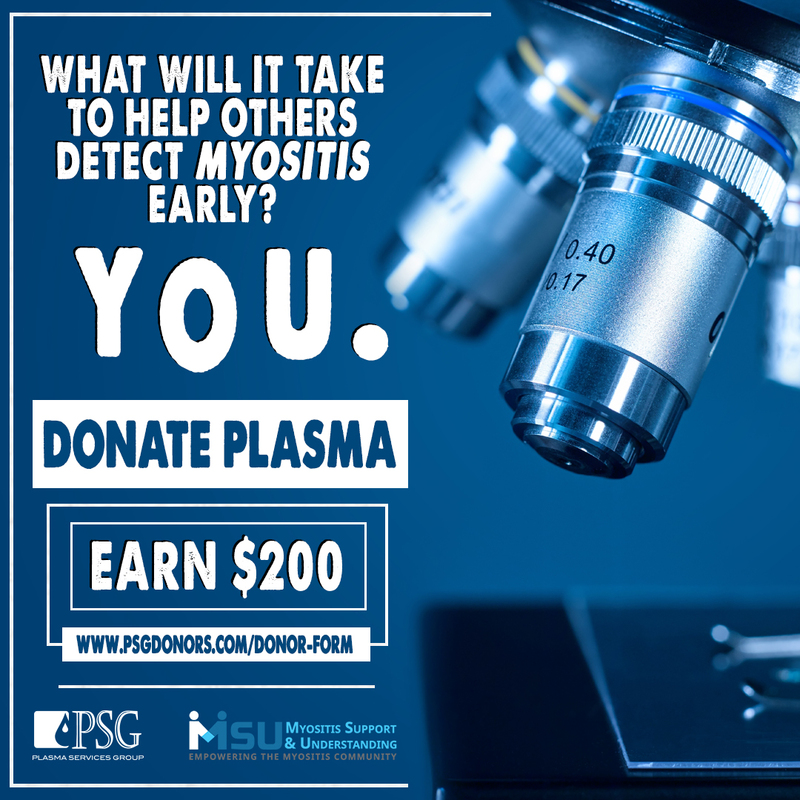 This test is frequently used to measure muscle damage with Myositis, however, not every person with Myositis has elevated CPK levels. CMP: Comprehensive Metabolic Panel – The comprehensive metabolic panel is used as a broad screening tool to evaluate organ function and check for conditions such as diabetes, liver, and kidney disease. The CMP may also be ordered to monitor known conditions, such as hypertension, and to monitor people taking specific medications for any kidney- or liver-related side effects. Items tested: Glucose, Calcium, Albumin, Total Protein, Sodium, Potassium, CO2, Chloride, BUN, Creatine, ALP, ALT, AST, Bilirubin. CRP: C-Reactive Protein is a protein made by the liver and released into the blood within a few hours after tissue injury, the start of an infection, or other cause of inflammation. ESR: The Erythrocyte Sedimentation Rate, also called a sedimentation rate (SED rate), or Westergren ESR, is the rate at which red blood cells sediment in a period of one hour. 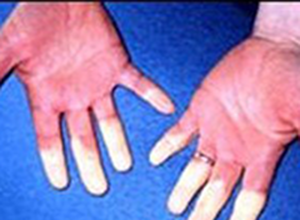 It is a common hematology test and is a nonspecific measure of inflammation. 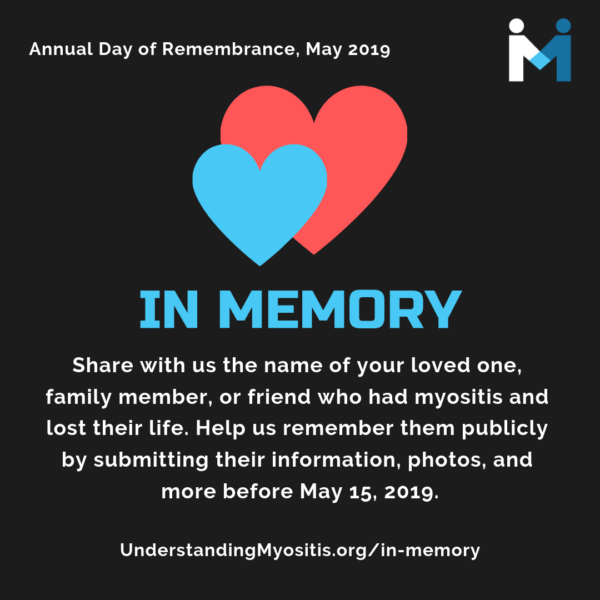 MAA: Myositis-Associated Antibodies are proteins are found in the blood of myositis patients as well as in the blood of patients with other autoimmune diseases. These autoantibodies are not specific to myositis. 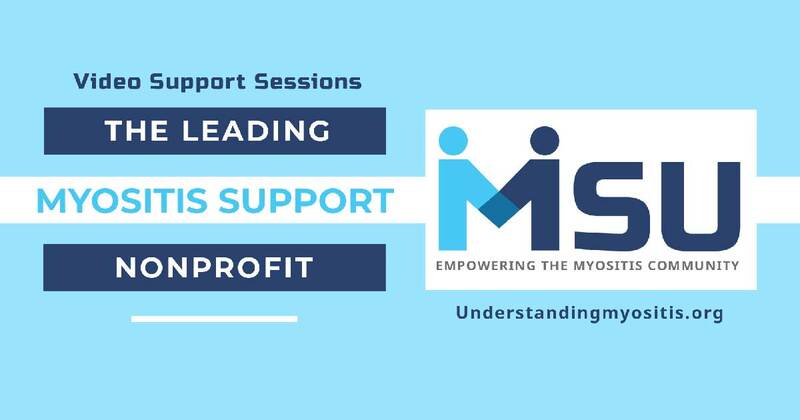 MSA: Myositis Specific Autoantibodies. These proteins are found only in the blood of myositis patients, therefore these autoantibodies are specific to myositis. An example of a MSA is the Anti-Jo-1 autoantibody. 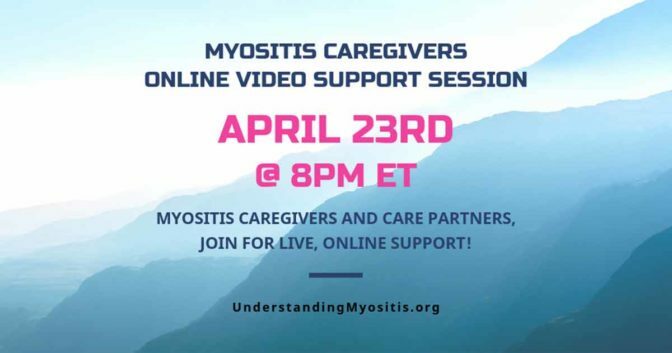 This is specific to Myositis. CT Scan: A Computerized Tomography Scan combines a series of X-ray images taken from different angles and uses computer processing to create cross-section images of bones, blood vessels, and soft tissues. CT Scan images provide more detailed information than X-rays. EMG: An Electromyogram measures the electrical activity of muscles at rest and during contraction. MMT: A Manual Muscle Test conducted by a physician is to determine the person’s muscle strength or ability of the muscle to move a part of the body against resistance. MMT is often performed throughout the disease course to follow the patient’s progress over time. MRI: Magnetic Resonance Imaging uses a magnetic field and radio waves to create detailed images of the organs and tissues within your body. The MRI is now being used to follow a patient’s progress as well as to help find a muscle for biopsy. Muscle Biopsy: Muscle Biopsy (Muscle bx) is a process of extracting muscle tissue which is believed to be inflamed. The tissue is then sent to a laboratory to put the tissue through thorough testing. NCS: A Nerve Conduction Study is a medical diagnostic test commonly used to evaluate the function, especially the ability of electrical conduction, of the motor and sensory nerves of the human body. Skin Biopsy: A Skin biopsy is a process where the skin is obtained for testing and viewing under a microscope. 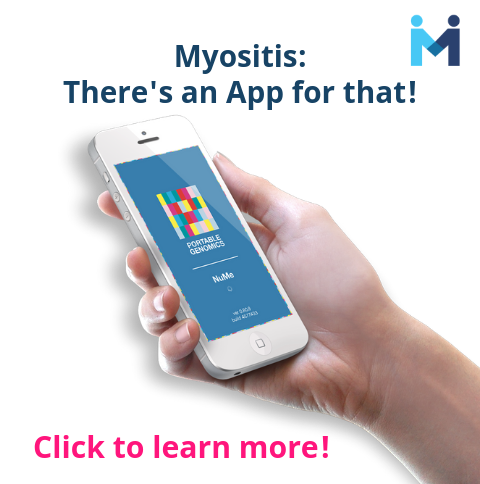 This is helpful for Dermatomyositis patients. Punch Biopsy: A doctor removes a deeper section of the skin by using a circular tool and having laboratory analysis conducted. ADL: Activities of Daily Living. These include things such as dressing, bathing, feeding. 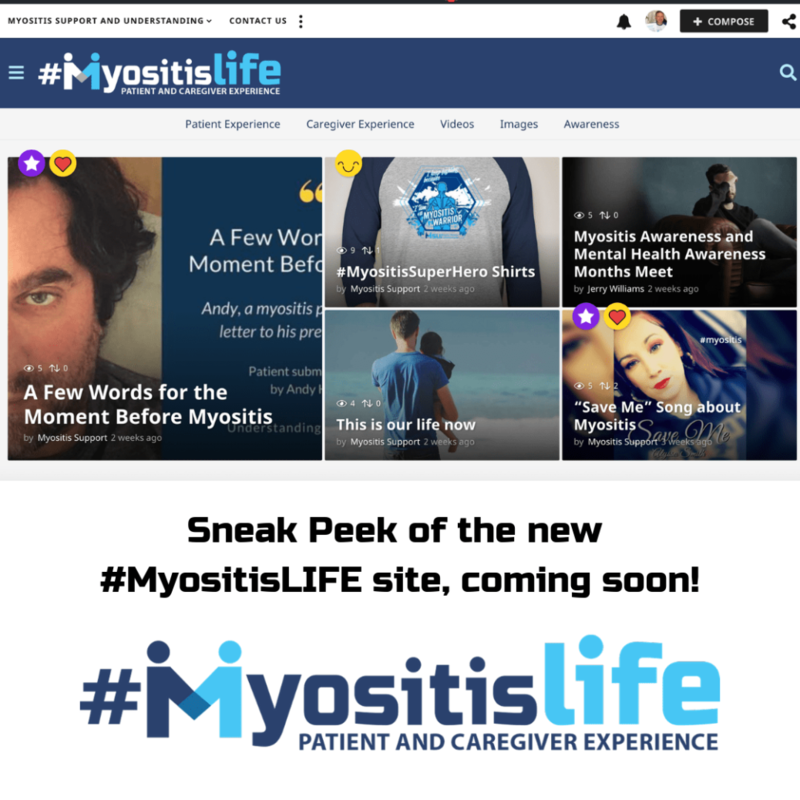 ADM: Amyopathic Dermatomyositis, which is also called “dermatomyositis sine myositis,” is Dermatomyositis with only skin symptoms and no muscle weakness or pain. AI: Autoimmune Disease: disease in which the body’s immune system, which normally fights infections and viruses, is misdirected and attacks the body’s own normal, healthy tissue through inflammation (swelling). Antisynthetase Syndrome: Diagnosis criteria requires one or more Antisynthetase Antibodies and one or more of the following three clinical features: interstitial lung disease, inflammatory myopathy, and inflammatory polyarthritis affecting small joints symmetrically. Astenia: Abnormal physical weakness or lack of energy. 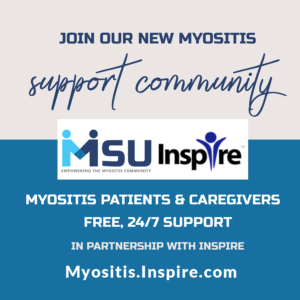 This is that feeling many myositis patients have that they may call fatigue. AVN: Avascular Necrosis (Osteonecrosis), often due to long-term, high-dose use of corticosteroids, is the death of bone tissue due to lack of blood supply which can lead to tiny breaks in the bone and bone collapse. Calcinosis: Hard and frequently painful lumps or sheets of calcium that form under the skin’s surface, especially in juvenile dermatomyositis. Contracture: Stiffening of a joint which causes the joint to shorten and stay bent. Diplopia: Double Vision; often seen with Orbital Myositis. Distal Muscles: Muscles which are located away from the core of the body such as forearms, calves, feet, hands, and fingers. Dysphonia: Voice problems such as weak or hoarse vocal sounds. Dysphagia: Difficulty swallowing or feeling like something is caught in the throat or chest. Flare: A return of past symptoms or increase in current symptoms after a period of remission or slower disease activity. Flares can occur when tapering medications too quickly or overexerting through exercise or stress. 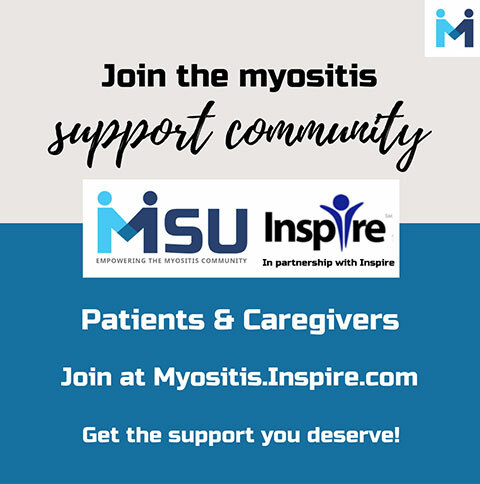 Some with Myositis might notice flares when they have been exposed to sunlight. Gottron’s Papules: Raised and usually scaly bumps which can be found over the knuckles, elbows, and knees. Gottron’s Papules are characteristic of both adult and juvenile dermatomyositis. Gower’s Sign: A medical sign that indicates weakness of the proximal muscles, namely those of the lower limb. The sign describes a patient that has to use their hands and arms to “walk” up their own body from a squatting position due to lack of hip and thigh muscle strength. Heliotrope Rash: Bluish-purple discoloration, often with swelling, around the eyes, especially the upper eyelids. This is the “classic” rash often found in Dermatomyositis. 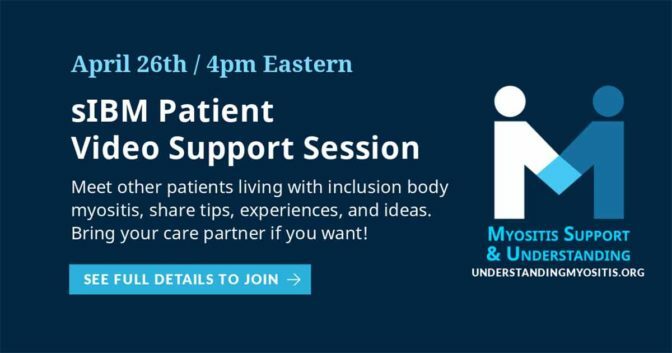 IBM: Inclusion Body Myositis (also referred to as sIBM or sporadic inclusion body myositis). This is the form of IBM we discuss and focus on. Idiopathic: No known cause. Example: Idiopathic Inflammatory Myopathies literally means Inflammatory myopathy with no known cause. Immune-mediated inflammatory disease (IMID) : Any of a group of conditions or diseases that lack a definitive etiology, but which are characterized by common inflammatory pathways leading to inflammation, and which may result from, or be triggered by, a dysregulation of the normal immune response..
Immunosuppressants: Drugs used to slow the body’s immune system in an attempt to keep it from mistakenly fighting healthy tissues. These medications lower the body’s ability to fight infection. These are also referred to as DMARDS (disease-modifying drugs) and steroid-sparing agents. IM: Intramuscular. This is a typical notation when noting or ordering an injection (shot) given into a muscle. 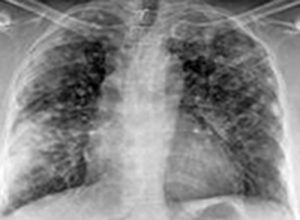 ILD: Interstitial Lung Disease is a group of lung diseases which causes progressive scarring of the lung tissue. 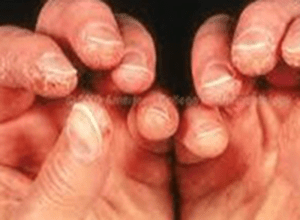 Mechanic’s Hands: Rough and cracked skin on the tips and sides of fingers with irregular and thickened cuticles. Dirty-looking horizontal lines can also appear on the hand sides and palms. MCTD: Mixed Connective Tissue Disease. An autoimmune disorder in which there are signs and symptoms of other connective tissue diseases, especially Lupus, Scleroderma, and Polymyositis. Myopathy: Muscle disease and muscle weakness. Muscle Fibrosis: Excessive formation of fibrous bands of scar tissue in between muscle fibers. Once the overproduction of fibrous scar tissue begins, the muscle becomes progressively weaker. 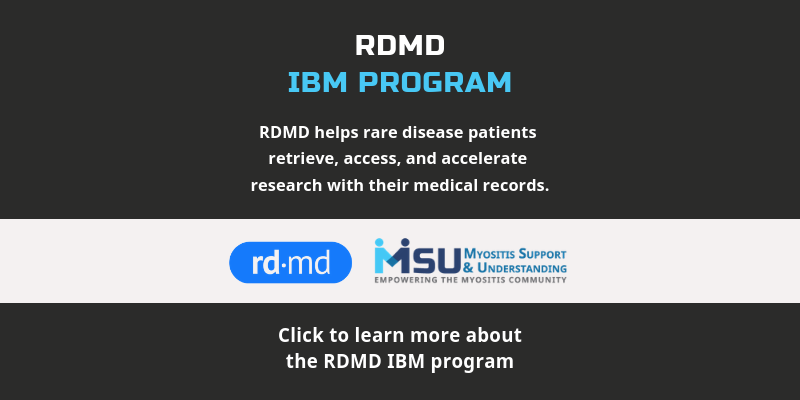 NAM: Necrotizing Autoimmune Myopathy. Similar to PM but shows muscle cell necrosis and regeneration without significant inflammation. Necrosis: Death of living tissue; specifically death of a portion of tissue differentially affected by local injury. OT: Occupational Therapy is designed to restore or maintain a patient’s ability to perform tasks used in daily living, often through developing ways to modify or adapt activities. Overlap Syndrome: A diagnosis which is made when a patient has more than one autoimmune disease. Some common overlaps are Rheumatoid Arthritis, Lupus, Scleroderma, and Sjögren’s. Port: (Sometimes called a chemoport) A device that is implanted under the skin to allow IV access for medications, such as for IVIG and Rituxan infusions. This is often required if a patient has poor veins. Proximal Muscles: Muscles located towards the center of the body or core, such as muscles of the thighs, hips, upper arms, neck, and stomach. PT: Physical Therapy: [also physiotherapy] treatment of a disease through physical activity with goals of restoring and/or maintaining functional activities. Refractory: Unaffected by treatment; resistant or unresponsive to treatment. In refractory cases of myositis, the medicines used do not ease the symptoms or the disease process. RA: Rheumatoid Arthritis is inflammation of one or more of the joints. The main symptoms of RA are joint pain and stiffness, which typically worsen with age. SubQ: Subcutaneous means under the skin. Some injections are given subcutaneously. Vacuoles: Holes in the muscle fibers evident in muscle biopsies of Inclusion Body Myositis (IBM) patients. Vasculitis: Swelling of blood vessels under the skin that causes a visible rash.